Chain of Responsibilities comes under Behavioural Pattern. In this, single pipeline is used and that pipeline contains all possible operations. A request can be easily passed among the objects. Behavioural Pattern – Mediator pattern is used to reduce the complexity in coding when a large number of classes are being used. 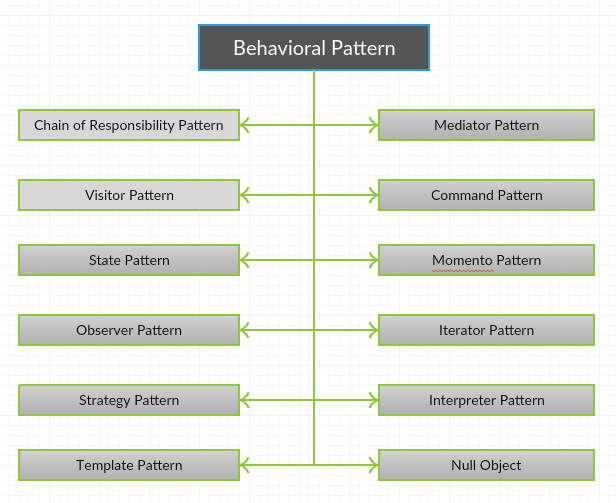 Behavioural Pattern – Visitor Pattern can be used to add extra features to a class. Command Pattern takes object as a request and stores it for future use. State pattern is used to change the behavior of the Object. When the state changes, the behavior of the object also changes. Momento Pattern is used to save the internal state of an object so that one can restore and use it. Observer Pattern is used to map one to many relationships. 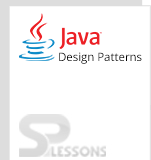 Iterator Pattern uses a common interface through which one can navigate to a set of data. Using Strategy Pattern an algorithm can be encapsulated inside a class. Using Interpreter Pattern one can easily understand the language. Using Template Pattern, one can define an algorithm in one class and implement in another class. Null Object Pattern is used to assign default values to an object. Behavioural Pattern are concerned with the interaction and responsibility of objects. Command Pattern is a behavioral pattern and a data driven pattern. Command pattern is also known as “Action” or “Transaction”.